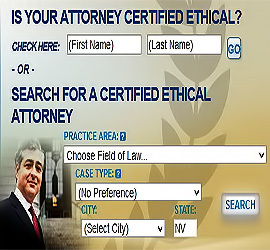 AttorneyGuide reviews the records of the appropriate State Bar Association(s) for each attorney listed on our site as Certified Ethical™. Even a single instance of public disciplinary action completely disqualifies an attorney from achieving a Certified Ethical™ rating — regardless of how long they have been practicing law. In other words, AttorneyGuide.com™ does the research to help you avoid unscrupulous attorneys, and to ensure that the attorney you hire is a Certified Ethical™ attorney. AttorneyGuide.com™ conducts thorough research to ensure the ongoing integrity of our attorneys. Though they must pay a nominal amount for this research, attorneys cannot buy an ethical rating — they must earn it. The certification is continual so long as the attorney meets and maintains AttorneyGuide’s specific criteria. In addition, AttorneyGuide regularly scrutinizes each attorney’s public record, no less than every sixty (60) days, for any violation that would immediately result in decertification. Despite what some attorneys may claim, win/loss ratios cannot be accurately measured. For instance, a football team has a very definite ratio with respect to wins and losses. In every single game, one team wins and one team loses – it is black and white. With respect to an attorney’s win/loss ratio, however, the measurement is much more difficult, if not impossible. For example, if an injured plaintiff wins at trial but receives less than the defendant offered to pay before the trial, then did the plaintiff win or lose? The attorney won the case, but the client received less than if they had settled before trial. As you can see, an attorney’s accurate win-loss record is very subjective. Consumers should be extremely cautious when hiring an attorney who claims a high win-loss ratio; instead, seek to hire an attorney who is honest and trustworty and can be certified as ethical. Some websites claim to only list the top 5% of lawyers in the profession — that is not possible. There is no official ranking of attorneys, nor is there any objective way to rank them. An attorney may be excellent for one client, but not for another. Thus, claims of being “the best” or in the top “5%” are entirely subjective and misleading. Similarly, claims of high “peer review” rankings are likewise subjective.